I’m writing this while traveling on Boundless Journeys’ Highlands & Islands Hiking adventure. As the destination manager for this trip, I am thrilled to experience it first hand and meet our guides and guests in person. We are five days in and having a fantastic time—I’m enjoying the food, hiking, and company in equal measure. The scenery is unbelievably wild, and our guide, Cory Jones, has impressed us all with his encyclopedic knowledge of the area. To get acquainted with Edinburgh, walk down the Royal Mile starting at Edinburgh Castle. For a traditional Scottish treat, step into the tiny shortbread shop of Pinnies and Poppy Seeds on St. Mary’s Road off the Royal Mile. They make unbelievably delicious fresh shortbread (so much better than tinned). Get there early because they do run out. The coconut shortbread dipped in white chocolate was particularly delightful. At the end of the Royal Mile is Holyroodhouse Palace, the summer residence for Queen Elizabeth II attached to an original section of Mary Queen of Scots’ palace. The ornate interiors in the “newer” wings are spectacular, while the history of the ruined abbey and original palace rooms are eerie. 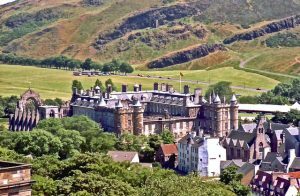 Just outside the palace complex is Holyrood Park with some lovely hiking trails—a great way to warm up before your tour or to extend your hiking afterwards. Head up Arthur’s Seat for fantastic views of Holyroodhouse, the city, and the coast. It used to be the hunting grounds for the palace. 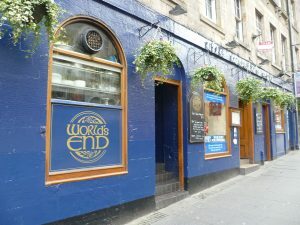 For a refreshment after all that walking, find World’s End—one of the oldest pubs in Edinburgh—about midway along the Royal Mile (not far from Pinnies) and is a popular place for locals and tourist alike. Friendly barkeeps and old world charm make it a good place to pop in for a pint! If by then, you’re ready for some food, Zizzi is a tasty Italian restaurant tucked behind the buildings on the Royal Mile. Find Mary King’s Close and go down the steps to the left. Good pizza, decent prices, and it’s nice to get away from the hustle and bustle of the main street. Start your day with a stroll through the Princes Street Gardens, sunken below street level between the New Town and Old Town. This is Edinburgh’s “Central Park”, and it’s lovely. Up until the mid-1700s, an artificial lake existed there that provided a defense for the castle but also collected the sewage from the Old Town. The city drained the lake and made the area a welcoming place to walk. There’s even a café for a morning coffee and pastry. The National Museum of Scotland is a 10-minute walk from the top of the Royal Mile. It’s a great museum to visit post-tour for the many artifacts from Orkney’s Skara Brae, which you will have visited with Boundless Journeys. From prehistoric tools to medieval weaponry and all sorts of random exhibits, there’s a little bit of everything, and you’ll get a good sense of Scottish culture and history—plus, it’s free! 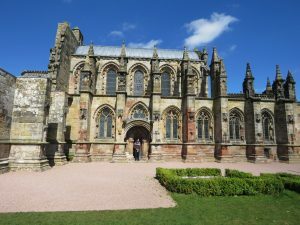 If you want to explore a bit further, Rosslyn Chapel, made famous in The Da Vinci Code, is about an hour south by public bus, or 30 minutes by car, and is worth the effort. The incredible carvings throughout the building are a sight to behold. It seems that no two surfaces are the same, and there is hidden meaning in everything—plenty of mysteries to ponder, like how the carvings of American corn cobs showed up sixty years before the continent was discovered…There’s a café on site afternoon tea. To round out the day, get a recommendation from your concierge for a traditional Scottish restaurant serving local food—there are many excellent options. For upscale, try The Kitchin on the waterfront or the Castle Terrace Restaurant. For something a bit more down-to-earth and cool atmosphere, head to The Doric. Make sure to read our Guide to Scottish Beer and Food to learn more about Scottish cuisine.